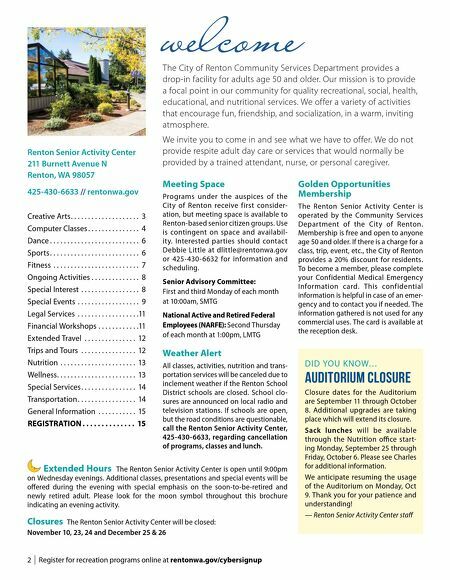 For more information, call the Renton Senior Activity Center at 425-430-6633 | 3 Volunteering for the Nutrition Program Help needed with set up, hostess- ing, food preparation, washing dishes and cleaning up. Food workers card is required. Hours range from 9:00am to 1:00pm, Monday–Friday. Contact Charles at 425-254-1128 Scholarship Opportunities Recreation facilities are required to recover more of the actual costs of providing programs. Thank s to a donation from our Renton Senior Advisory Committee, scholarships are available to qualifying low income seniors to help offset the cost of some classes and programs. 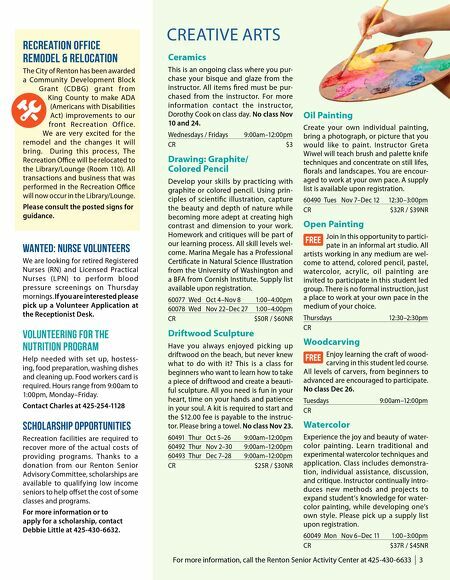 For more information or to apply for a scholarship, contact Debbie Little at 425-430-6632. WANTED: Nurse VOLUNTEERs We are looking for retired Registered Nurses (RN) and Licensed Practical Nurses (LPN) to per form blood pressure screenings on Thursday mornings. If you are interested please pick up a Volunteer Application at the Receptionist Desk. CREATIVE ARTS Ceramics This is an ongoing class where you pur- chase your bisque and glaze from the instructor. All items fired must be pur- chased from the instructor. For more information contac t the instruc tor, Dorothy Cook on class day. No class Nov 10 and 24. Wednesdays / Fridays 9:00am–12:00pm CR $3 Drawing: Graphite/ Colored Pencil Develop your skills by practicing with graphite or colored pencil. Using prin- ciples of scientific illustration, capture the beauty and depth of nature while becoming more adept at creating high contrast and dimension to your work. Homework and critiques will be part of our learning process. All skill levels wel- come. Marina Megale has a Professional Certificate in Natural Science Illustration from the University of Washington and a BFA from Cornish Institute. Supply list available upon registration. 60077 Wed Oct 4–Nov 8 1:00–4:00pm 60078 Wed Nov 22–Dec 27 1:00–4:00pm CR $50R / $60NR Driftwood Sculpture Have you always enjoyed picking up driftwood on the beach, but never knew what to do with it? This is a class for beginners who want to learn how to take a piece of driftwood and create a beauti- ful sculpture. All you need is fun in your heart, time on your hands and patience in your soul. A kit is required to start and the $12.00 fee is payable to the instruc- tor. Please bring a towel. No class Nov 23. 60491 Thur Oct 5–26 9:00am–12:00pm 60492 Thur Nov 2–30 9:00am–12:00pm 60493 Thur Dec 7–28 9:00am–12:00pm CR $25R / $30NR Oil Painting Create your own individual painting, bring a photograph, or picture that you would like to paint. Instructor Greta Wiwel will teach brush and palette knife techniques and concentrate on still lifes, florals and landscapes. You are encour- aged to work at your own pace. A supply list is available upon registration. 60490 Tues Nov 7–Dec 12 12:30–3:00pm CR $32R / $39NR Open Painting Join In this opportunity to partici- pate in an informal art studio. All artists working in any medium are wel- come to attend, colored pencil, pastel, watercolor, acr ylic, oil painting are invited to participate in this student led group. There is no formal instruction, just a place to work at your own pace in the medium of your choice. Thursdays 12:30–2:30pm CR Woodcarving Enjoy learning the craft of wood- carving in this student led course. All levels of carvers, from beginners to advanced are encouraged to participate. No class Dec 26. Tuesdays 9:00am–12:00pm CR Watercolor Experience the joy and beauty of water- color painting. Learn traditional and experimental watercolor techniques and application. Class includes demonstra- tion, individual assistance, discussion, and critique. Instructor continually intro- duces new methods and projects to expand student's knowledge for water- color painting, while developing one's own style. Please pick up a supply list upon registration. 60049 Mon Nov 6–Dec 11 1:00–3:00pm CR $37R / $45NR Recreation Office Remodel & Relocation The City of Renton has been awarded a Community Development Block G r a nt (CD B G) g r a nt f ro m King County to make ADA (Americans with Disabilities Act) improvements to our front Recreation O f f ice. We are very excited for the remodel and the changes it will bring. During this process, The Recreation Office will be relocated to the Library/Lounge (Room 110). All transactions and business that was performed in the Recreation Office will now occur in the Library/Lounge. Please consult the posted signs for guidance.